We Believe ? ? ? In the news, great attention has been paid to the activities of fast food workers striking to increase their salary up from minimum wage, their plight with fast food restaurants, and their heavy reliance on public assistance to get-by. Included with fast restaurant workers whose employers are represented by the National Restaurant Association are full service restaurant workers who make up the bulk of the worker in the restaurant industry. The plight of full service restaurant workers is documented in an article by Sarah Anderson at IPS. Of the 4 million people working in the restaurant industry, 50% rely on public assistance to get by at a cost of $9.5 billion. This rivals WalMart and other low wage retailers who also depend on public assistance and communities for their employees. While restaurants like Papa John’s complain about having to pick up the tab for healthcare insurance or having to raise prices 10 cents for a medium pizza, they fail to mention taxpayers are paying the hidden cost to their low wages. 8 of the 10 lowest paid jobs are represented by restaurant workers of which 5 are in the full service restaurant segment. To supplement underpaid restaurant workers (which also subsidizes their employers) and is paid by taxpayers are public assistance programs such as Medicaid and CHIP health Insurance programs, the federal earned income tax credit (EITC), food stamps (SNAP), basic household income assistance (TANF), the national school lunch program, childcare assistance, low income home energy assistance program, section 8 housing, and housing choice vouchers. What has not been mentioned is a second form of subsidy to full service restaurants through the sub minimum wage, which also requires customers to pay these workers’ wages directly through tips. The industry is not being decimated by rising costs, employment is expected to grow 10% by 2022 suggesting greater industry growth and translating into higher public assistance costs and less labor productivity. “Full-service restaurant workers are at the core of America’s growing low-wage economy; many of these workers’ earnings are far below what’s needed to meet their subsistence needs.” Greater than 21 percent of all tipped workers live in poverty representing 2.5 times the overall work force in poverty. At a cost of $9.5 billion to subsidize the industry, it may be worthwhile for taxpayers to decide whether to pay the money upfront rather than through government programs. 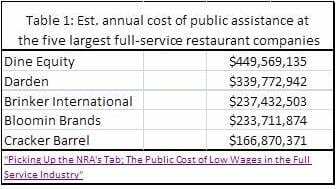 Table 1 represents the five biggest players in the Full Service Restaurant business segment and the annual cost of public assistance subsidies. Along with Olive Garden, Darden owns six smaller chains: LongHorn Steakhouse, Capital Grille, Bahama Breeze, Seasons 52, Eddie V’s and Yard House. Darden employs 150,000 employees with over 1500 locations and serves 320 million meals annually. DineEquity is better known as IHOP and owns the Applebys chain. With nearly 3600 locations it is bigger than Darden; but, most of the restaurants are franchises. Brinker International is the parent company of the Chili’s as well as the smaller Maggiano’s Little Italy chain. By its name, you may recognize Bloomin Brands as the owner of Outback Steakhouse. Add to this, Carraba’s Italian Grill, Bonefish Grill, and Fleming’s Prime Steakhouse and Wine Bar. If you have not passed a Cracker Barrel in the southeast or while traveling south; then, your eyes have not been open. These companies are heavily subsidized through public assistance. Are you going to end up paying more for a nice meal at many of these restaurants, the answer is yes you will. The cost of which will transition from the rear door where it is hidden and to which you are paying it anyways after being handled multiple times to the front door and “potentially” going directly to the restaurant worker serving you. Either you believe in a fair wage for a fair day’s work or you believe in keeping an underground of subsistence existence financed by you in the end and continued subsidizing of companies. It is appropriate to eliminate the tipped sub-minimum wage and raise the minimum wage. This is something ALEC the mouth piece for the National Restaurant Association and state governments have been fighting. A particular emphasis should be placed on raising wages at companies which use public assistance to supplement payroll wages. Continue to provide support programs for minimum wage workers. Actively encourage collective bargaining by restaurant workers as a buttress against large companies which today have legislature and private organizations such as ALEC at their backs. With the renewed emphasis, it is only then can Labor begin to reap some of the productivity gains denied them. Matt Leichter received his J.D.-M.A. in law (2008) and international affairs (2009) from Marquette University, in Milwaukee, Wisconsin, and spent a semester and summer of law school at Temple University’s Tokyo campus in 2007. Before law school, he taught English at Omiya High School in Saitama, Japan, for two years. He started the Law School Tuition Bubble in May of 2010. Matt writes about student debt. I read his post on Jason Delisle’s critiqe on Income Based Repayment for Masters level graduates and felt it was worthy for AB. Income Based Repayment (IBR) caps the amount of money a graduate is to pay based upon income. Jason Delisle and William Holt did an opinion piece on the Washington Post and a similar argument by Jason Delisle has popped up over at the Washington Monthly. Jason has claimed the Income Based Repayment (IBR) plan in Student Loans has first cost the government $21 billion and then cost the government $19 billion. 1. No evidence is cited by Jason Delisle showing the resulting $21 billion cost is the result of the IBR. This is supposition and conjecture on the part of Jason and meant to cause consternation on the part of the reader as to the alleged abuse. Matt Leichter of Law School Tuition Bubble blog takes issue with Jasons stance and attributes the $21 billion to changes to the model inputs reflecting less job growth or could potentially be the result of greater participation in the program. Without the evidence of where the numbers came from, Jason’s opinion piece is speculation. 2. Matt continues the take down of Jason’s adding more points which the reader can dwell upon. Jason uses the $21 billion eye catcher to segue into graduate students abusing the IBR to back back less. The problem is Graduate Plus Loan Program causing the issue rather the IBR with its unlimited funding. While admitting this is an issue, Jason takes the opportunity to attack the IBR. 3. Grad students abusing the IBR program is more supposition on Jason’s part. He has not established a foundation of data and stats to support his contention. There is only a hypothetical with no data to support Jason’s conjecture. For example, some data might show how many Grad students are on the IBR, how many have high enough incomes to repay the loans in less than 5 years, and how many Grad students are on the IBR who could not afford to repay under the old programs. Broad based data establishes a foundation to which we can ascertain how many students are abusing the IBR under its current rules. Answering the question of how many students are not paying back within 20-25 years as opposed to beneficiaries of the IBR may cause changes in the rules. Jason expects us to accept his hypothetical on pure faith. 4. To make his point Jason develops a hypothetical Law student just graduating, having $150,000 in debt and earning $70,000 annually. Jason’s hypothetical student graduates with $150,000 in college debt and a $70,000 does little to bolster his argument. For example; while the $150,000 in debt is possible, the salary is not as it exceeds the median for a student just starting out as reported by the National Association for Law Placement, Inc. Matt correctly points out Jason’s hypothetical is in the upper 23% of household income for beginner lawyers. The true median income is ~$62,000 and would include part time workers and those unemployed as reported by the NALP. Jason then add a spouse wife to the household to boaster his hypothetical. The spouse makes $80,000 annually which ratchets the couple into the top 10% bracket of houshold incomes. The question still remains of validity of this hypothetical as Jason never cites any data to support his contention. Once again we are left in the dark with Jason’s assumption. Furthermore, the IBR does not take spousal income into account and Jason and William take the IBR to task for not doing so. Matt counters with an argument; “Are you shocked? Well, the response is, so what? Robert’s wife didn’t sign the master promissory notes any more than she would his gambling debts. If Robert wants to leave work to raise their kids, for example, it doesn’t imply that his wife would essentially assume his debts. Would the NAF say this if Robert were Roberta? How would unmarried Robert feel if he had to tell his bride-to-be that she’d be partly on the hook for his student loans if they got married? Again, what if Robert were Roberta, who would be more likely to take time off to raise children? Delisle and Holts hypothetical do little to make their claim the IBR is at fault for this phenomena. In realty and as Matt correctly points out, the same could have occurred with a lottery winning by the parents or other gains neither of which have any influence on IBR policy. In the end, how many actually gain from the loophole in policy. Jason’s supposition again lacks data. 5. The claim of Graduates IBR being unfair beneficiaries is made again by Delisle and Holt and they comprise 50% of all recipients of the IBR program. Graduates also attend Bachelor programs (quelle surprise!). Here again no data is supplied and we are given an opinion of what may be taking it to the extreme. Jason creates another Pink Cadillac scenario, an image of graduates driving Pink Cadillacs to currency exchanges to cash their big checks are about all Delisle and Holt can conjure up. We are left in the dark to imagine this to be occurring on a regular basis. 6. IBR was never developed by lawmakers with Grad Plus Loans in mind. Rather than a problem with the IBR, the problem lies with the Grad Plus program which both Delisle and Holt overlook to make their attack. As Matt Leichter questions the credibility of the complainers contentions throughout their expose, no data is presented to support their claims of misappropriation of funds which is to the root cause. The claims are all hypothetical. 7. 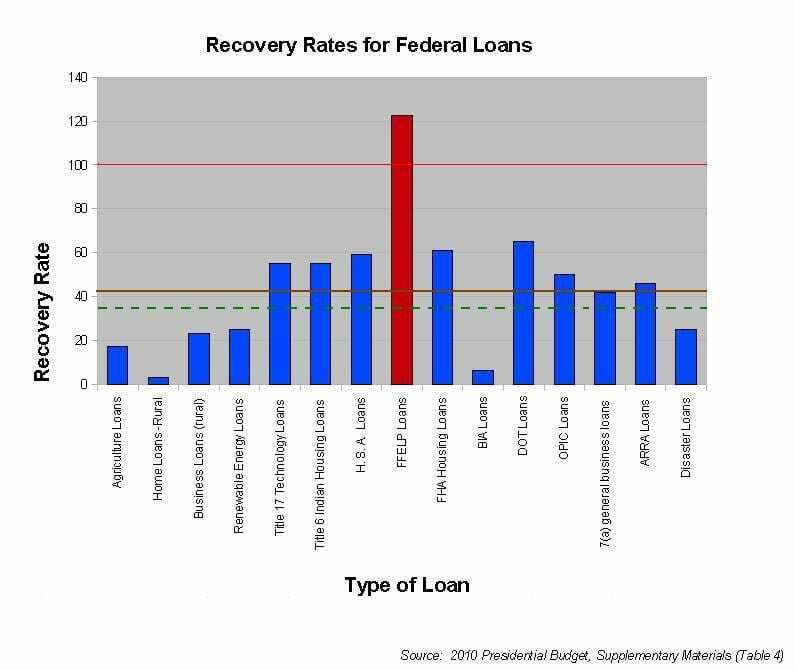 Jason takes this one-step further in his analysis, stating the Federal Government provides loans at a reasonable interest rate(?). This is so far from the reality of the situation it borders on the ludicrous. As I have stated before, no other loan made has such tight restrictions on it and can not be discharged through bankruptcy. The distinction between the two types of Loans is one can be discharged in bankruptcy and the other can not. Guess which one can be discharge? Students are bound by a signature to indentured servitude until the loan is paid off or 20-25 years pass of IBP. Matt make a common sense point on the real implicit contract between students, the government, and student loans; “the implicit contract was the Loans would make debtors into more productive workers filling higher paying and skilled jobs.” The evidence since the seventies does not support the advent of more and higher paying jobs to have happened and Jason’s version of contract has gone unfulfilled from the government side leaving many of its citizens economically harmed. “New America Foundation: Let the Sins of Grad PLUS Be Visited Upon IBR”The Law School Tuition Bubble blog, Matt Leichter, February 2015. It has been a while since I had last talked to Alan. I knew at the time he was at issue with a stance the Center for American Progress was taking on Student Loans which surprising are supported by some of our more popular consumer advocates. Kind of makes sense as we now see the Center for American Progress cuddling up with the Koch Brothers? Not what I would call a marriage made in heaven benefiting us and I wonder who will own whom in the end. Law and Order Koch Brothers suddenly concerned about the incarceration rate in the US? Yeah, right! Save that one for another post. Anyhow, Alan moved from Tacoma, Washington to Washington, D.C. to confront CAP on their stance. Amongst loans, it is no secret student loans make money and make even more money in default. from the Federal Family Education Loan Program (FFELP) student loan which comprises a majority of all outstanding student loans; the Department of Education can recover $1.22 (before collection costs, and the government’s “cost of money”) on every dollar loaned. Student loans are not a zero sum game as some critics might have you believe. Well, maybe not a trillion, but hundreds of billions. About 75% of the $1.2 trillion in outstanding student loan debt is eligible to be refinanced, and the creditworthy tranche of this debt–the part private investors are eyeing–totals at least $200 billion. So far Common Bond has made some $100 million in loans to current students and graduates of 109 M.B.A., J.D., M.D. and engineering programs at 50 brand-name schools. Another VC-backed company, three-year-old SoFi (for Social Finance), has refinanced more than $1 billion in student debt held by 13,500 graduates of 2,200 schools, making it the largest refinancer in the market. This leaves no doubt where some of the emphasis on refinancing student loans my be coming from today. I wonder if Moodys will rate it AAA as they did with tranched CDO/MBS and not care about the securty of the loan(s) in each tranche? In particular the former statistic of payback after default refutes the arguments of student loan critics the likes of Jason Delisle (New America) and Brookings Beth Akers and Matt Chingos who advocate Fair Market Valuation of Student Loans to assess risk. It might make sense to do so, if a student loan was the same as a home mortgage or a piece of machinery in a factory; but, student loans are not the same. By a student’s signature, a student loan becomes a roach motel as there is no way out through bankruptcy. You can wait 20-25 years and get out of it on an IBP plan, die, become disabled, or do public service to get out of potions of it. If you default, the Government will garnish your wages, SS, Disability to collect their money besides disqualify you from any federal programs. CAP’s How Qualified Student Loans Could Protect Borrowers and Taxpayers proposes returning bankruptcy protections to student loans. A closer examination of the plan reveals this program would disqualify many federal and private loans from having access to bankruptcy. Instead what is seen are alternatives to bankruptcy such as gainful employment, income based payment, service loan forgiveness, payment on tim interest reductions, etc. most plans of which are teasers with only a low percentage of applicants being accepted and successful. CAP and other liberal advocates push for these repayment programs which in the end result in the majority of people who try for the benefit being kicked out before anything is forgiven. CAP has recruited a former director of the Department of Education lending program David Bergeron who does not appear to have brought anything new to the discussion other than repayment programs which may cause more damage in the end. The issue still remains of bankruptcy protection in the form of what was given to big business and TBTF by Congress and in the end walked away from $billions in responsibility over the decades. Guess students do not get a benefit of the doubt. Another proposal by David Bergeron and CAP is a federal refinancing plan for private loans. The plan would refinance private loans at lower interest rates, taking them over from private banks at book value and offering a better deal than what was offered to investment firms (made into banks by Geithner and given access to Fed money). Nonperforming loans would be included in this plan also as a bailout and makes the government a private industry bill collector for loans which more than likely should not have been made. The impact of this plan would help a few borrowers and in the end may hurt them as they lose protection under the statutes of limitations. While Democrats favor the two aforementioned plans, Republicans are still stuck in the past of no bankruptcy protection for student loan holders, complaining of the high cost of repayment programs and the lending system, and suggesting private banks for student loans as subsidized by the Feds can do a better job. Students and parents would be at the mercy of the banks. Republicans would resurrect a taxpayer subsidized banking system such as what our venture capitalist would love and was put to its grave by Obama who stopped short of revamping the entire student loan system. There is no serious accommodation for middle and low income students coming from Republicans. Republicans have abandoned their free-market attitude by not affording students the same protection afforded TBTF and big business under bankruptcy and Democrats have embraced the past with people such as Bergeron from the Department of Education who help create today’s student loan and repayment environment. What mostly brought the nation to today’s bad student loan environment is a Congress dead set against “supposed” lazy students escaping any responsibility for something they signed up for as 18 year-olds, a student loan system fraught with a profit motive forcing young people and their parents into an indentured servitude to banks with the Gov as the bill collector, nonprofit and for-profit colleges not having any responsibility for the loans offered to their students, uncontrolled college employee expenses due to the addition of staff beyond teaching staff, decreased state funding for colleges, federal grants and scholarships which have not kept up with inflation, etc. The only cost to have exceeded healthcare cost increases is that of the higher cost of education. In the end, what many young college graduates earned in a living well beyond what could be made with just a high school education is far less when compared to decreased high school income and years previous. While the percentage difference may be the same, the actual income for college grads has decreased. Young couples with little or no student loan debt have accumulated higher levels of assets in comparison. Worthy of a read of (or if you want a listen to) a recent Commencement speech given by Ken Burns at Washington University calling on recent graduates to help fix what previous generations have left broken and incomplete. I have posted both the verbal and the written version for you to select. “a tall, thin lawyer, prone to bouts of debilitating depression, addressed the Young Men’s Lyceum. The topic that day was national security. The Text: Chancellor Wrighton, members of the Board of Trustees and the Administration, distinguished faculty, Class of 1965, hard-working staff, my fellow honorees, proud and relieved parents, calm and serene grandparents, distracted but secretly pleased siblings, ladies and gentlemen, boys and girls, graduating students, good morning. I am deeply honored that you have asked me here to say a few words at this momentous occasion, that you might find what I have to say worthy of your attention on so important a day at this remarkable institution. It had been my intention this morning to parcel out some good advice at the end of these remarks — the “goodness” of that being of course subjective in the extreme — but then I realized that this is the land of Mark Twain, and I came to the conclusion that any commentary today ought to be framed in the sublime shadow of this quote of his: “It’s not that the world is full of fools, it’s just that lightening isn’t distributed right.” More on Mr. Twain later. Over the many years of practicing, I have come to the realization that history is not a fixed thing, a collection of precise dates, facts and events (even cogent commencement quotes) that add up to a quantifiable, certain, confidently known, truth. It is a mysterious and malleable thing. And each generation rediscovers and re-examines that part of its past that gives its present, and most important, its future new meaning, new possibilities and new power. Listen. For most of the forty years I’ve been making historical documentaries, I have been haunted and inspired by a handful of sentences from an extraordinary speech I came across early in my professional life by a neighbor of yours just up the road in Springfield, Illinois. In January of 1838, shortly before his 29th birthday, a tall, thin lawyer, prone to bouts of debilitating depression, addressed the Young Men’s Lyceum. The topic that day was national security. “At what point shall we expect the approach of danger?” he asked his audience . . . . Shall we expect some transatlantic military giant to step the Earth and crush us at a blow?” Then he answered his own question: “Never. All the armies of Europe, Asia, and Africa . . . could not by force take a drink from the Ohio [River] or make a track on the Blue Ridge in a trial of a thousand years . . . If destruction be our lot, we must ourselves be its author and finisher. As a nation of freemen, we must live through all time, or die by suicide.” It is a stunning, remarkable statement. That young man was, of course, Abraham Lincoln, and he would go on to preside over the closest this country has ever come to near national suicide, our Civil War — fought over the meaning of freedom in America. And yet embedded in his extraordinary, disturbing and prescient words is a fundamental optimism that implicitly acknowledges the geographical force-field two mighty oceans and two relatively benign neighbors north and south have provided for us since the British burned the White House in the War of 1812. But the isolation of those two mighty oceans has also helped to incubate habits and patterns less beneficial to us: our devotion to money and guns; our certainty — about everything; our stubborn insistence on our own exceptionalism, blinding us to that which needs repair, our preoccupation with always making the other wrong, at an individual as well as global level. And then there is the issue of race, which was foremost on the mind of Lincoln back in 1838. It is still here with us today. The jazz trumpeter Wynton Marsalis told me that healing this question of race was what “the kingdom needed in order to be well.” Before the enormous strides in equality achieved in statutes and laws in the 150 years since the Civil War that Lincoln correctly predicted would come are in danger of being undone by our still imperfect human nature and by politicians who now insist on a hypocritical color-blindness — after four centuries of discrimination. That discrimination now takes on new, sometimes subtler, less obvious but still malevolent forms today. The chains of slavery have been broken, thank God, and so too has the feudal dependence of sharecroppers as the vengeful Jim Crow era recedes (sort of) into the distant past. But now in places like — but not limited to — your other neighbors a few miles as the crow flies from here in Ferguson, we see the ghastly remnants of our great shame emerging still, the shame Lincoln thought would lead to national suicide, our inability to see beyond the color of someone’s skin. It has been with us since our founding. When Thomas Jefferson wrote that immortal second sentence of the Declaration that begins, “We hold these truths to be self-evident, that all men are created equal…,” he owned more than a hundred human beings. He never saw the contradiction, never saw the hypocrisy, and more important never saw fit in his lifetime to free any one of those human beings, ensuring as we went forward that the young United States — born with such glorious promise — would be bedeviled by race, that it would take a bloody, bloody Civil War to even begin to redress the imbalance. But the shame continues: prison populations exploding with young black men, young black men killed almost weekly by policemen, whole communities of color burdened by corrupt municipalities that resemble more the predatory company store of a supposedly bygone era than a responsible local government. Our cities and towns and suburbs cannot become modern plantations. It is unconscionable, as you emerge from this privileged sanctuary, that a few miles from here — and nearly everywhere else in America: Baltimore, New York City, North Charleston, Cleveland, Oklahoma, Sanford, Florida, nearly everywhere else — we are still playing out, sadly, an utterly American story, that the same stultifying conditions and sentiments that brought on our Civil War are still on such vivid and unpleasant display. Today, today. There’s nothing new under the sun. Many years after our Civil War, in 1883, Mark Twain took up writing in earnest a novel he had started and abandoned several times over the last half-dozen years. It would be a very different kind of story from his celebrated Tom Sawyer book, told this time in the plain language of his Missouri boyhood — and it would be his masterpiece. Set near here, before the Civil War and emancipation, ‘the Adventures of Huckleberry Finn’ is the story of two runaways — a white boy, Tom Sawyer’s old friend Huck, fleeing civilization, and a black man, Jim, who is running away from slavery. They escape together on a raft going down the Mississippi River. That may be the finest moment in all of American literature. Ernest Hemingway thought all of American literature began at that moment. Twain, himself, writing after the Civil War and after the collapse of Reconstruction, a misunderstood period devoted to trying to enforce civil rights, was actually expressing his profound disappointment that racial differences still persisted in America, that racism still festered in this favored land, founded as it was on the most noble principle yet advanced by humankind — that all men are created equal. That civil war had not cleansed our original sin, a sin we continue to confront today, daily, in this supposedly enlightened “post-racial” time. It is into this disorienting and sometimes disappointing world that you now plummet, I’m afraid, unprotected from the shelter of family and school. You have fresh prospects and real dreams and I wish each and every one of you the very best. But I am drafting you now into a new Union Army that must be committed to preserving the values, the sense of humor, the sense of cohesion that have long been a part of our American nature, too. You have no choice, you’ve been called up, and it is your difficult, but great and challenging responsibility to help change things and set us right again. Let me apologize in advance to you. We broke it, but you’ve got to fix it. You’re joining a movement that must be dedicated above all else — career and personal advancement — to the preservation of this country’s most enduring ideals. You have to learn, and then re-teach the rest of us that equality — real equality — is the hallmark and birthright of ALL Americans. Thankfully, you will become a vanguard against a new separatism that seems to have infected our ranks, a vanguard against those forces that, in the name of our great democracy, have managed to diminish it. Then, you can change human nature just a bit, to appeal, as Lincoln also implored us, to appeal to “the better angels of our nature.” That’s the objective. I know you can do it. Remember: Black lives matter. All lives matter. Reject fundamentalism wherever it raises its ugly head. It’s not civilized. Choose to live in the Bedford Falls of “It’s a Wonderful Life,” not its oppressive opposite, Pottersville. Do not descend too deeply into specialism. Educate all your parts. You will be healthier. Replace cynicism with its old-fashioned antidote, skepticism. Try not to make the other wrong. Remember, insecurity makes liars of us all. Listen to jazz. A lot. It is our music. Read. The book is still the greatest man-made machine of all — not the car, not the TV, not the computer or the smartphone. Do not allow our social media to segregate us into ever smaller tribes and clans, fiercely and sometimes appropriately loyal to our group, but also capable of metastasizing into profound distrust of the other. Serve your country. By all means serve your country. But insist that we fight the right wars. Governments always forget that. Convince your government that the real threat, as Lincoln knew, comes from within. Governments always forget that, too. Do not let your government outsource honesty, transparency or candor. Do not let your government outsource democracy. Vote. Elect good leaders. When he was nominated in 1936, Franklin Delano Roosevelt said, “Better the occasional faults of a government that lives in a spirit of charity than the consistent omissions of a government frozen in the ice of its own indifference.” We all deserve the former. Insist on it. Insist that we support science and the arts, especially the arts. They have nothing to do with the actual defense of the country — they just make the country worth defending. And even though lightning still isn’t distributed right, try not to be a fool. It just gets Mark Twain riled up. And if you ever find yourself in Huck’s spot, if you’ve “got to decide betwixt two things,” do the right thing. Don’t forget to tear up the letter. He didn’t go to hell — and you won’t either. So we come to an end of something today—and for you also a very special beginning. God speed to you all. – McDonalds turns 75 today, an empire of 36,000 restaurants in 199 countries. McDonalds is the largest buyer of beef, pork, potatoes, lettuce, and tomatoes globally and the second largest buyer of chicken after KFC. While faced with greater competition, McDonalds has started to revamp its offerings to recapture what it has lost and meet need market demands. – Blue singer who needs no introduction, B.B King died while in hospice last night. He was 89 years old. Interesting post by Sandwichman at Econospeak on this topic. “Fast forward to today. We want more jobs — that is to say more hours of work –but we want less greenhouse gas emissions. We face not only a paradox; but, a dilemma. The horns of this dilemma are yoked together, not just ‘in principle’ but in the physical, mechanical agent of both the economy of fuel and the economy of labor: the machine.” Can not get one without the other? – Roads surfaces harnessing solar power? So far the effort to use the ~37 million miles of road globally has not been successful or cheap. Netherlands based Sola Roads has installed solar panels protected by glass and bedded on rubber and concrete in cycling roads and is achieving positive results. Next step is to install the panels on roads and see if the panels and installations will hold-up under automobile and truck traffic in the same manner and results. – “No Good Reason To Work 5 Days a Week.” A 1965 Senate subcommittee predicted Americans would work 14-hour weeks by the year 2000, and before that, back in 1928, John Maynard Keynes wrote “technological advancement would bring the workweek down to 15 hours within 100 years.” To date we have not made much progress in this direction and even though the ratio of direct labor content has decreased, many still contend Labor is the largest cost factor. Are workers more efficient working 4 days per week as opposed to 5? “the clever system devised at a company he used to work for. The company was divided into two teams. One would work from 7 a.m. until 6 p.m. from Monday to Thursday, and the other would work those hours from Tuesday to Friday. The teams would switch schedules every week, so every two-day weekend would be followed by a four-day weekend. The results, Stephens reports, were positive. The company was open five days a week, from 7 a.m. to 6 p.m. instead of 8 a.m. to 5 p.m. He claims that morale skyrocketed. Employees took fewer sick days, visiting the doctor in off hours rather than during the workday.” It appears workers were more efficient in this example. A little Linda Ronstadt to Soothe the Night . . .
“And what about the cost of housing them? Execution could be cheaper if we were to subvert the rights of prisoners during trial and on appeal to state and federal courts. A 2003 legislative audit in Kansas revealed total costs for the death penalty at 70% more than non-death sentence cases with a median cost of $1.26 million as opposed to $.74 million. Since 1995 when the death sentence was reinstated in NY, the cost for each of 5 people condemned, not executed yet, was ~$23 million per person for a total of $165 million. The Comptroller for the state of Tennessee audit revealed that death sentences cases increased costs by 48%. These are costs associated with the trial up till and including sentencing and not taking into account appeals. “New Jersey taxpayers over the last 23 years have paid more than a quarter billion dollars on a capital punishment system that has executed no one.” 197 capital cases, 60 convictions, 50 overturned, and no executions carried out since 1983. Average cost = ~$25 million/conviction. and more completely on incarceration. “What does a growing prison and correctional population cost for taxpayers? To support the growing state prison population, costs range from ~$13,000 in Louisiana to ~$45,000 in Rhode Island annually (2005). The average is ~$23,000 annually, “US Imprisons 1 in every 100 Adults” NYT. The cost of imprisonment compares nicely to a state or private college education (another story). As a whole the US imprisons a higher percentage of its population than any other nation in the world from which the cost burden of housing prisoners has become an issue for states with a decreasing/stagnant economy and decreasing tax revenues. Paradoxically while costing more, jails and prisons for many communities are a stable and growing business employing people, services, and a fast growing part of the rural economies. By far and given our justice system, it is less costly to imprison a person for life than to execute them. Raising an argument of changing the justice system to accommodate quicker executions at a lower cost goes against the grain of what this country is supposed to represent (please leave this argument at the door). There is a sound monetary argument to imprison a person for natural life rather than put them to death for murder and also to reconcile the law giving shorter sentencing for those guilty of nonviolent crime. A recent PEW study is showing a change in the attitudes of people towards execution. While the study still shows the majority of the population believes in executing prisoners convicted of murder, the people in favor of it are at the one of the lowest levels in 40 years. 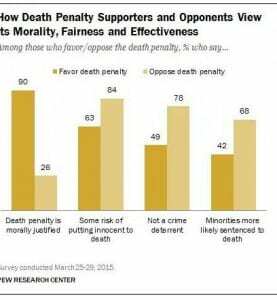 56% of the populations are in favor of the death penalty and 38% oppose the death penalty. A closer examination of who makes up the majority and minority leads to a breakout by partisanship and politics. 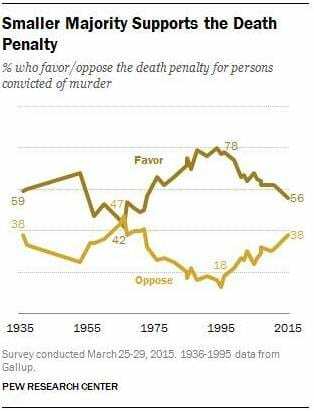 40% of Democrats still support the death penalty a decline of 31% since 1995. 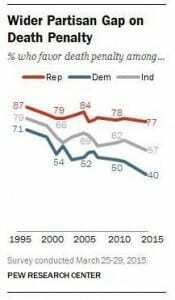 Declared independents supporting the death penalty declined from 79% in 1995 to 57% in 2015. 77% of Republicans support the death penalty, which is down from 87% in 1995. The Pew study has found doubts amongst many within its survey in how the death penalty is applied and whether it does deter crime. A majority or 63% of participants in the study believed the death penalty is justified in cases of murder, 31% said there is no moral justification, and 7% believed it depends. 1 in 4 of those surveyed did not believe there were adequate safeguards in place to prevent an innocent prisoner from being put to death. This is borne out by the many who have had their sentences commuted or were released after further investigation. 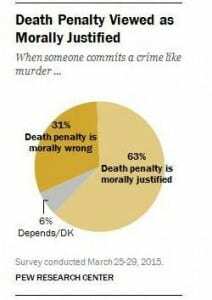 While the argument has been made the death penalty deters serious crime, 35% believed it did and 61% believed it did not. 41% of those in the study believed whites and minorities share the same likelihood of being sentenced to death while 52% believed minorities were more likely to be given the death penalty. As I have argued before and it is well borne out in studies, minorities who lack resource to pay for adequate defense and the failure of the Public Defender system to provide adequate defense leaves the minority population at greater risk to the death penalty. There is a growing minority base who oppose the death penalty; however, those favoring it have remained relatively stalwart. If you are in favor of the death penalty, you are likely to be a white male Republican, 51 years or older, with at least a high school education, and religious. Since 2011, there has been a softening of attitude towards the death penalty by Democrats, women, minority, nonwhite practitioners of religious beliefs and those with no affiliation to a religion. 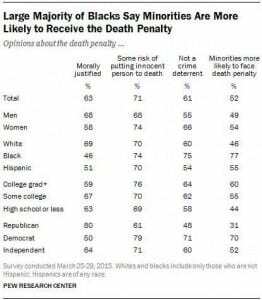 77% of Blacks say minorities are more likely to face the death penalty than are whites. 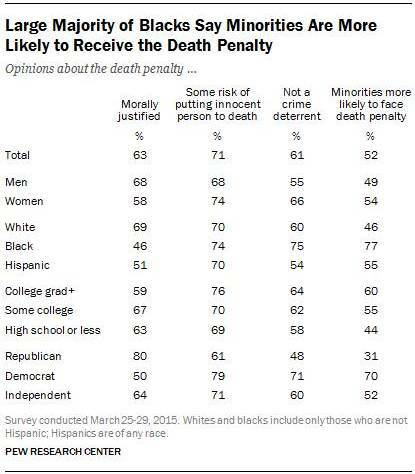 Democrats polled at 70% in on the same question while 48% of Republicans claimed minorities are more likely to face the death penalty. Much of this can be seen playing back from the white population out of Baltimore, Ferguson, and other communities faced with minority protests from black citizens over random killing of unarmed minorities. Many of the minorities lack the financial well being to bring on a strong defense in court rooms and they have to rely on overworked, understaffed, under-financed, and often times inexperienced state public defenders. 85% of all cases in the court system today are plea bargained. While there are sharp moral divides between those who oppose and those who favor the death penalty, there is an agreement between the two groups there are dangers of an innocent being put to death. Federal Judge Jed S. Rakoff sums it up in one sentence (full comment below) on those who go to court as defendants; “Basically, we treat them like dirt.” The trip and expense of going to court is anything but as glamorous as shown on TV on shows such as “LA Law.” If you do not accept a plea bargain and you make the prosecution work; in the end and if you lose, you will be faced with harsher sentencing than if you accepted the plea bargain. The vast majority of people do not have the finances to fight back and are left to accept a public defender as their council. I do not wish to demean public defenders; but in many states, they are overworked, underpaid, often times inexperienced, etc. Your chance of winning slowly ebbs with each negative. 85% if not more cases are plea bargained and many of those who accept a plea bargain are a minority. “In many respects, the people of the United States can be proud of the progress we have made over the past half-century in promoting racial equality. More haltingly, we have also made some progress in our treatment of the poor and disadvantaged. But the big, glaring exception to both these improvements is how we treat those guilty of crimes. Basically, we treat them like dirt. And while this treatment is mandated by the legislature, it is we judges who mete it out. Unless we judges make more effort to speak out against this inhumanity, how can we call ourselves instruments of justice?” Judge Jed S. Rakoff, “Mass Incarceration: The Silence of the Judges,” The New York Review of Books. 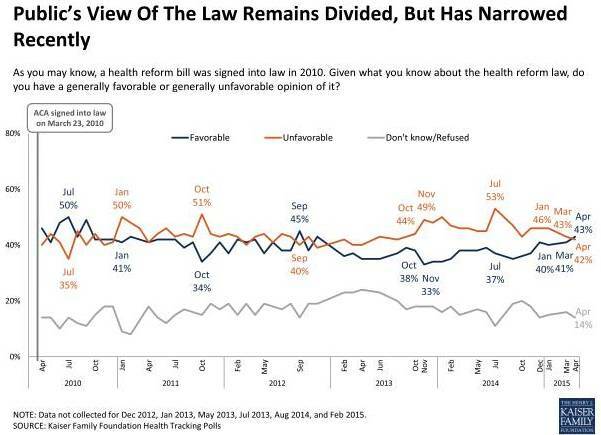 A recent Kaiser Poll shows favorable results for the PPACA the first time since 2012. 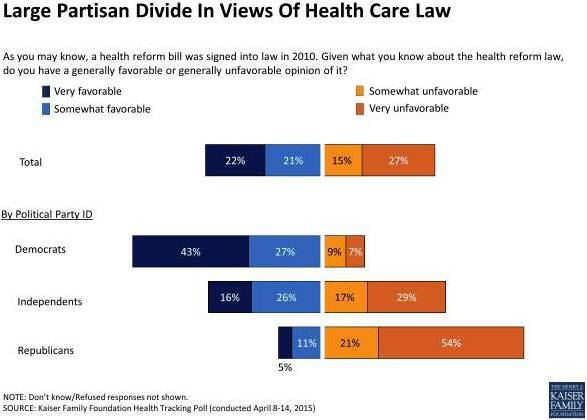 43% have a favorable view of the PPACA and 42% have an unfavorable view of it. While the report shows a favorable view, it is within the margin of error (+ or – 3%) and not statistically significant (Click on the graph[s] for a larger version). Even though the Public’s View is split and slightly favoring the PPACA, the percentage of people who wish Congress to finish implementation or expand the PPACA is 46% as opposed to those wishing to repeal or scale it back at 41%. This opinion has remained consistent for six months of the Kaiser survey. In how the PPACA is viewed plays mostly along partisan political lines with Democrats favoring it and Republicans opposing it. In total, it is an equal split favoring and opposing it. 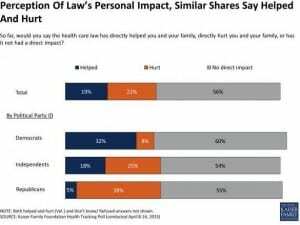 Does the PPACA hurt, help, or have a direct impact upon you. Again, this plays along the partisan political beliefs of the people with Democrats claiming it helped as opposed to the Republicans claiming it hurt. In all three cases and taking into consideration the politics of the people, the majority claimed the PPACA had “No Direct Impact” upon them. In March 2015, the CBO recalculated and revised the expected costs of the PPACA downward. 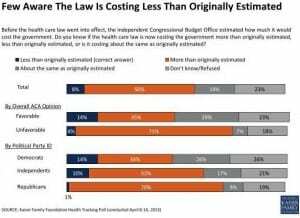 This went largely unnoticed and few people realize the PPACA would cost less than expected. 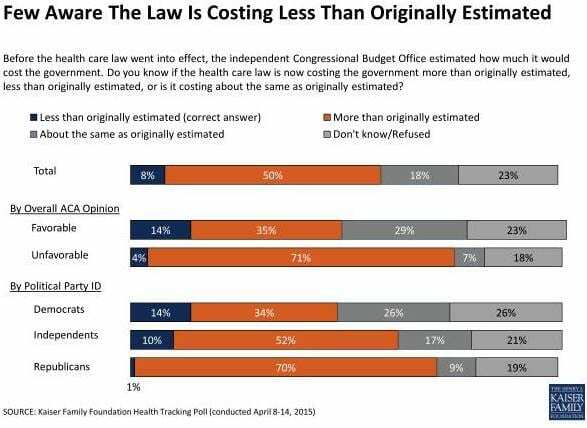 50% still believe it would cost more and another 15% said the same as originally estimated. 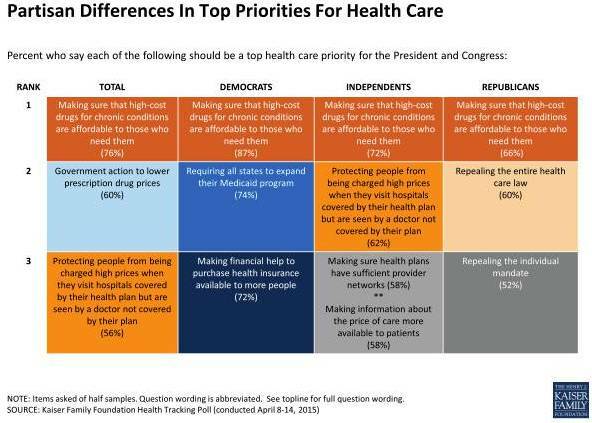 Interestingly enough is the agreement of the #1 priority for healthcare; all politics aside and by a super-majority, people want “drugs for chronic conditions to be affordable to those who need them. When looking at the Total picture, drug prices and hospital charges are other priorities people wish addressed. There is more to the Kaiser Survey which can be found here: Kaiser Health Tracking Poll: April 2015. Looking at Figure 6 of the survey, both Democrats and Republicans agree on making prescription drugs more affordable giving it the highest priority for Congress. Other priorities were making hospital costs more affordable and greater protections against out-of network doctors and associated costs; making sure provider networks were sufficiently large enough in the plans, and making information more readily available to patients about the price of doctors’ visits, procedures, and tests, such as hip replacements and MRIs. Along similar lines as what Kansas has been doing with its budget for education, Louisiana has been cutting in favor of doling out large tax cuts and credits for business getting in return little if any economic impact. While A&E’s Duck Dynasty receives ~$330,000/episode from the state, Louisiana State University is preparing for additional budget cuts to meet the $1.6 billion State of Louisiana self-inflicted budget deficit much of which was caused by the state legislature and Jindal’s repeal of the balance of the Stelly Plan in 2008. The state never had a history of stable revenue growth and was faced with shortfalls until the legislature came up with a plan to shift taxes from mostly a regressive sales tax to a progressive state income tax as well as other taxes. Income taxes grow faster than sales taxes growth as incomes repond faster in good economic times. The progressive Stelly Plan raised taxes on higher income brackets in 2002 and cut the state sales taxes on electricity, natural gas, food and water for residential use. Before 2003, the State of Louisiana had gone through annual budget crisis. With the passage of the 2002, the Stelly Plan raised income tax rates to 6% on individual $25,000 to $50,000 incomes of; established 4% on joint income from $25,000 to $50,000, and 6% >$50,000 on joint income; the state had a balanced tax system mostly reliant upon the income tax, severance taxes, and sales taxes. In 2007, when Governor Jindal was elected, the state experienced a surplus in revenue not experienced in previous years. “Jindal inherited a $1.1 billion surplus from former Gov. Kathleen Blanco. He blew the surplus in his first year as governor embracing the rollback of the Stelly Plan voters approved in 2002, the elimination of excess itemized deductions, and the higher rates which resulted in a total hit to the state of $1.4 billion in 2008. The rollback of Stelly has cost the state more than $300 million a year since then.” It is after the tax rollbacks, where more of the blame other than mismanagement is foisted upon Jindal. Jindal has increased tax exemptions and credits on businesses regardless of the benefit to the state in jobs or business growth. Rather than maintain the UAL (retirement funds) at a fundable level, its liability has grown from $12 billion to $20 billion setting up a day of reckoning in the future. According to The Advocate; Louisiana gives away more taxpayer money than any other state on a per capita basis. – Enterprise Zone program has done little to spur investment and job creation in poor areas, its original intent. Instead, the bulk of the taxpayer money the program doles out — an average of about $70 million annually in recent years. – The Workforce and Innovation for a Stronger Economy Fund or WISE, a fund that was set up to send $40 million to higher education institutions around the state in an effort to help higher education programming match the state’s job market, is likely to be scrapped as a part to balance the state’s budget. – “The potential that could hit us would be tuition fee increases, 3,000 less course offerings, etc. Less notable universities in Louisiana without the political influence would fair worst under Jimdal’s budget cut program. The state no longer has the money to fund K through 12 education, higher education such as LSU, state healthcare and mental programs as the funding has disappeared in tax breaks to business boondoggles and unfairly skewed to those making up 1% of the income (~$25,000 advantage annually). Governor Jindal is a hopeful presidential candidate. To point out how silly some of the business tax breaks are given at the expense of Louisiana citizens and the state, the state legislature and Jindal sponsored Sales tax holiday for the Purchase of Weapons.